Injury of the inferior alveolar nerve (IAN) sustained during surgical removal of an impacted lower third molar may cause paresthesia of the lower lip, chin, lower gingivae and anterior teeth. Lingual nerve (LN) injuries may result in ipsilateral paresthesia of the anterior two thirds of the tongue, mucosa of floor of mouth and lingual gingivae. A close anatomic relationship between the roots of the third molar and mandibular canal places the IAN at risk of damage. The primary aim of this retrospective audit was to ascertain the incidence of IAN and LN damage after mandibular third molar surgery in National Dental Centre Singapore. A secondary aim was to identify the contributory factors for the risk of IAN and LN nerve injury on the basis of the data collected. 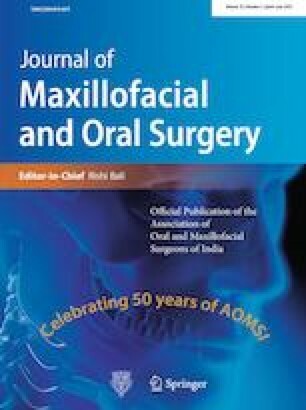 This retrospective audit included 1276 mandibular third molar surgical removals performed in the local anesthesia operating theatre (LAOT) at the National Dental Centre Singapore (NDCS) from April to December 2013. Data included patient details, clinical characteristics, and 1 week postoperative presence/absence of sensory alteration as reported by the patient. Summary of results- Out of 1276 third molar sites audited, 8 (0.62%) sites had altered sensation of the IAN and 1 (0.078%) had altered sensation of the LN at 1 week postoperative review. The incidence of IAN injury (0.62%) and lingual Nerve injury (0.08%) after one week from surgery in our audit was low compared to similar studies. This retrospective audit did not show any correlation of nerve injury to age, gender, race, site, angulation of tooth, grade of operator, removal of bone or tooth division. There was no single radiological sign associated with paresthesia, although the most common radiological signs were interruption of the canal line and darkening of the roots.